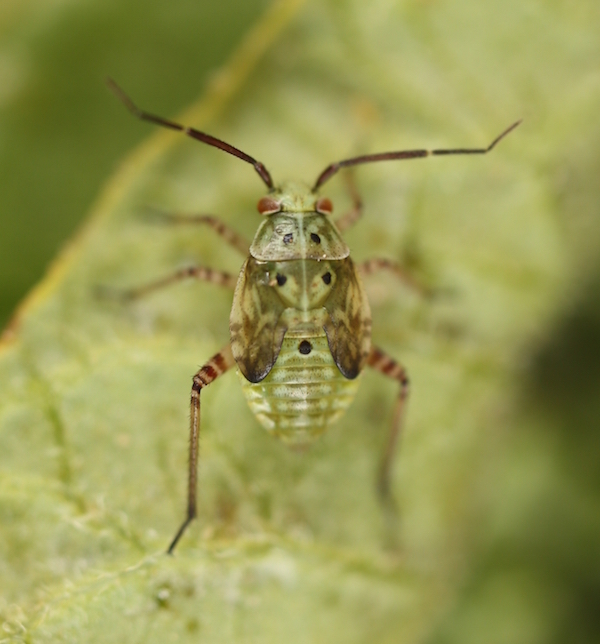 Lygus bugs have piercing-sucking mouthparts and physically damage the plant by puncturing the tissue and sucking plant juices. They puncture seed pods and feed on the developing seeds causing them to turn brown and shrivel. Scout lygus at late flowering and podding stages using a standard insect sweep net of 38 cm (15″) diameter. Take ten 180° sweeps, and aim to sweep the flowers and pods while moving forward. Count the number of lygus in the net. The Prairie Pest Monitoring Network notes that sampling becomes more representative IF repeated at multiple spots within a field. For lygus bug monitoring, sampling is most accurate when repeated at a total of 15 spots within the field. Samples can be taken along or near the field margins. 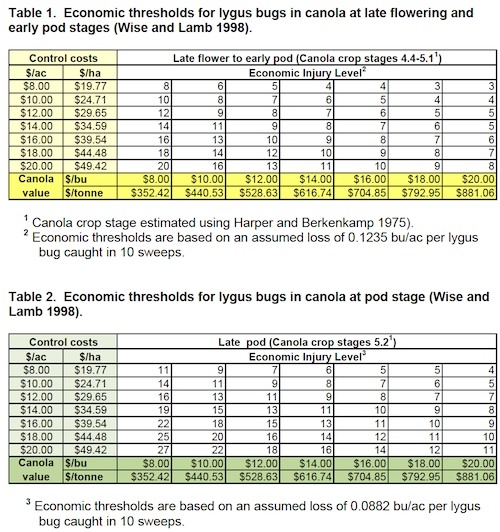 Since adults can move into canola from alfalfa, check lygus bug numbers in canola when nearby alfalfa crops are cut. Count adults and late-instar nymphs. Nymphs are young lygus, and only the larger nymphs do enough damage to be included in sweep net counts. A key feature is the black dots on the back. Count nymphs with developing wingpads or dark shoulder blades. Don’t count them if they’re small and don’t have the any sign of a dark growth where wings will be developing soon. 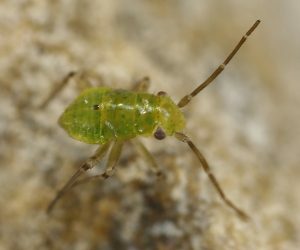 These small nymphs don’t feed very aggressively, and they are vulnerable to heavy rains and wind that push them down in the canopy or to the ground where they drown or get eaten by other insects. If you are seeing a lot of earlier nymphs, check again every few days. It may take only a week for lygus to grow from early to late instar stages. 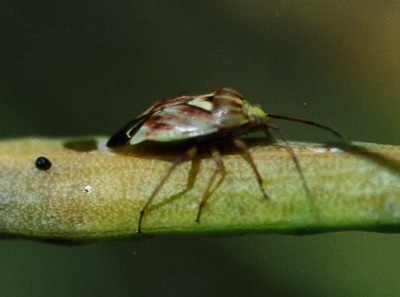 If swathing is a week away and most lygus are small nymphs, these nymphs are unlikely to have time to grow into a threat before the crop is cut. The threat generally ends when most pods become “leathery” and when seeds inside are no longer squishy. As outer pod tissue toughens up and seeds become firm to roll, lygus can no longer penetrate the pods.